Some teenagers are perfectionists and spend every waking moment studying and working. Parents must ensure the mental and physical well-being of their kids and can encourage their teens to take time for themselves. Condone your teenagers for taking breaks and spending time doing something fun between their obligations. This will help them be more productive and relaxed. Physical activity can be a great resource for de-stressing. Running, swimming and even dancing help the body produce hormones and chemicals that promote happiness. Plus, it's a lot of fun to get moving together! Along with the typical benefits of working out, like burning calories and getting in shape, your family can enjoy bonding and having fun with one another. Those overachieving teenagers may forgo hanging out with buds to prepare for final exams, studying for tests or working on upcoming projects. 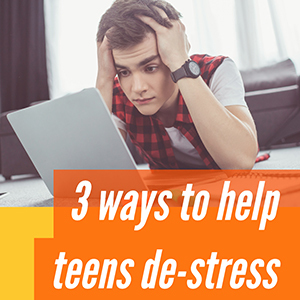 While these habits are helpful, teens are still kids at heart and need to spend some time with peers. Having fun is a great de-stresser, but so is talking with others in similar positions, like classmates who are also worried about applying for college and getting into their dream universities. Even talking over the phone can help teenagers discuss their worries and fears, reducing anxiety and promoting better sleep and a clearer head. Make sure your kids focus on school and taking steps to care for their emotional well-being. Their grades, attitude and sleep will benefit. Copyright © 2000-2019 FunEducation, Inc. All rights Reserved.